$14 Million ROI. $500K Realized In First Week. 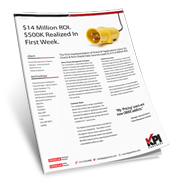 The First Implementation of Oracle BI Applications Using 10+ Oracle & Non-Oracle Data Sources Leads To A $14 Million ROI. The corporation is a diversified power management company and a global technology leader in electrical components and systems for power quality, distribution and control; hydraulics components, systems and services for industrial and mobile equipment; aerospace fuel, hydraulics and pneumatic systems for commercial and military use; and truck and automotive drivetrain and powertrain systems for performance, fuel economy and safety. The company has approximately 70,000 employees and sells products to customers in more than 150 countries. Eaton is a global technology leader in electrical components and systems for power quality, distribution and control; hydraulics components, systems and services for industrial and mobile equipment; aerospace fuel, hydraulics and pneumatic systems for commercial and military use; and truck and automotive drivetrain and powertrain systems for performance, fuel economy and safety. Eaton has approximately 70,000 employees and sells products to customers in more than 150 countries.